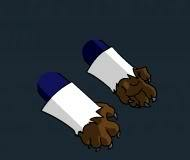 Team 10 Animal Gloves - . Description: Your animal side is breaking loose from your team 10 costume. Looks like you need to trim your nails. Note: Gloves are Color Custom to Hair Color.